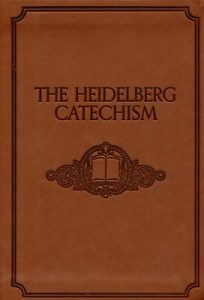 When Jesus’ disciples asked him for instruction in prayer, he told them to begin, “Our Father in heaven.” As the Heidelberg Catechism points out (questions 120 and 121), there’s a tension built in to that opening gambit: “Father” indicates that God is like us in some way; “in heaven” indicates the opposite. You might say that what Jesus offers with one hand (“Father”) he seems to remove with the other (“in heaven”). But the goal of his instruction is not some ludic erasure of signifiers, or wordless Zen encounter. He is quite serious about leading us into communion with his Father and our Father, and he does so by giving us solid teaching about how God aligns and misaligns with our preconceptions and expectations. Not everything we expect is wrong; not everything is right. We have to be carefully taught. It should be no surprise that when we call Jesus the Son of God, we have to undergo a similar discipline in our usage of the revealed words. Is he the Son of God? Yes. But can we project onto the word “Son” everything from our human experience of sonship? Is he younger than his Father? No, you Arians. Is he the child of a union between a divine Mother and Father? No, you Gnostics. Is he –the questions stumble over their own clumsiness, and show themselves up as arbitrary. Christian faith is not in the business of catching at a few words from God and then guessing by projection what they must mean, filling them out by associations. Faith seeking understanding is in the business of learning what God means by what God says when he calls himself Father, and Son, and Holy Spirit.